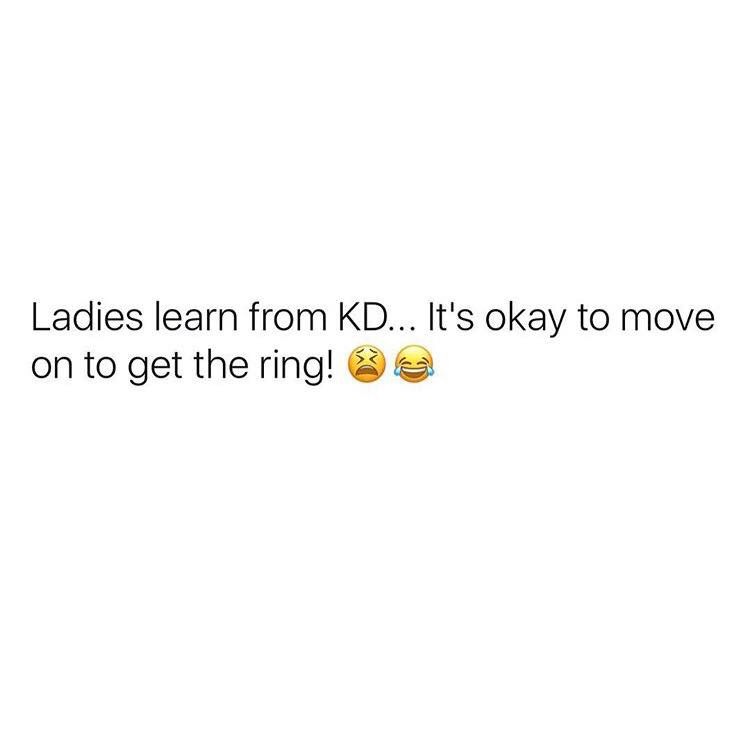 Why Kevin Durant is every woman that levels up after a failed relationship. If you haven’t heard, last night the Golden State Warriors won the 2017 Championship in a game 5 win against the Cleveland Cavaliers. If you don’t follow basketball, you know that this rivalry has been real the last few years, but this year it was especially controversial. Kevin Durant, Finals MVP, signed with Golden State this year after losing to them in the playoffs last year with his original team, Oklahoma City Thunder. Why does this matter to you? Glad you asked. Kevin Durant was drafted in 2007 as the number 2 pick (a big deal) to the Seattle Supersonics, who became the Thunder in 2008. He has multiple scoring titles, a league MVP award and had plenty of trips to the playoffs with this team. For 9 years he played with this team and he’d finally had enough and decided to move on. But KD didn’t just move on, he leveled up. Golden State had already won a championship, and were pretty close to winning one last season without him. What’s notable about Golden State across the board is their connection as a team. They play together and although they have a few superstars, all of them know their roles and play them well. KD had a teammate by the name of Russell Westbrook in OKC. Anyone who knows me, knows the word I used to describe him. CLOWN. Don’t get me wrong, Westbrook is a great player. He’s talented and he plays with passion. But it seemed that whenever this duo got close to winning a title, he’d get out of control. Throwing up shots without thinking, very erratic and worried about himself (my perspective on how he plays). He seems to be more for himself than the team. KD wanted a championship ring (the highest honor of a team sport were his words last night) and he knew to get one he not only had to go to a good team, but he had to go somewhere that the common goal was top priority. This meme makes so much sense! Ladies, it’s okay to stick it out in a good situation if you feel like it has potential to be great and get your desired goal of a marriage. After years and years of not getting what you want, it’s time to let go. But don’t just let go and move on to another failed relationship, be smart and level up. Find the best fit for you. Find someone who has the same goal as you and is willing to let you shine if it means you both win in the end. Thanks KD for the level up lesson! Absolutely. I’ve always been team “If you can’t give me what I need, someone else will”. I wish more ladies wouldn’t be so afraid to move. I’m getting here. Slowly, but surely!